How many of these biggest lies of mainstream nutrition do you still believe? Sadly, they are still being reported by those who haven’t caught up with the science yet. 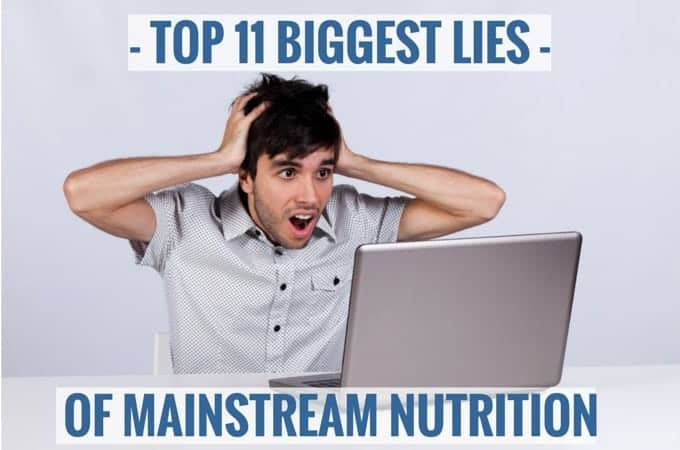 The Top 11 Biggest Lies Of Mainstream Nutrition, originally written by Kris Gunnars on Authority Nutrition, has to be one of the best articles around. It pretty much summarises what is wrong with modern nutritional advice. Take a look at his article for all the references and studies. We have been told to restrict our egg intake due to the scare of raising our cholesterol and our risk of heart disease. It has been proven that cholesterol in the diet does not raise cholesterol in the blood, and eggs are one of the most nutritious foods around. An easy source of protein, vitamins and minerals, eggs are an easy and versatile food which we should be consuming more of. A number of flawed studies and shoddy science has led us to this conclusion back in the 1960’s and it has been shown to be completely wrong. A review article in 2010 which covered over 347,000 people showed there was absolutely no link whatsoever between saturated fat and cardiovascular disease. This unproven theory that the 2 are related has now become conventional wisdom and the basis of the various food pyramids/food plates. Eating MORE natural saturated fats (meat, cheese, butter, coconut oil) actually raises you HDL (the one you want more of) and makes your LDL from angry oxidised little critters that attack the cell walls, into large fluffy ones which are pretty benign. Eating grains are pretty much a modern addition to our diet in the big scheme of evolution and our genes haven’t changed considerably to allow us to digest them. Grains are pretty low in nutrition, contain phytic acid which stops us from absorbing minerals from our gut, modern wheat contains a high amount of gluten, causing leaky gut (with or without symptoms) which can cause bloating, cramp, and brain disorders (namely schizophrenia, depression and alzheimers) and are high in carbohydrates (refined or not). By removing grains from your diet, you will introduce far more nutrition than that lost by not eating a slice of whole grain bread. Yes studies have shown that by eating a high protein diet increases calcium excretion from your bones and kidneys, but long term the effect is the opposite!!! Long term studies show high protein actually improves bone strength and does not increase your risk of kidney disease in healthy people. The biggest risk factors of kidney disease are high blood pressure and diabetes – both of which are improved by eating high protein. Because of the low fat food guidelines (see number 2) food manufacturers, marketing and advertising has boomed into the low fat industry. But what happens when you remove the fat? The flavour, volume and texture are removed so they bump it up with sugars, high fructose corn syrup and all other manner of sweeteners and fillers to make up for it. Next time you are at the supermarket, take a look at the nutrition labels of low fat cream cheese and regular cream cheese. The one I buy is 2% carbs for the regular full fat, yet 15% carbs for the lite low fat version. You can probably guess I buy the 2% one. Also full fat foods keep you fuller for longer, hence the need to actually eat less. Low fat ‘food products’ are so processed, leave them on the shelf. This is another urban myth that continues. Apparently if you eat small meals often, it will raise your metabolism! Studies have shown that given the same food in 3 or 6 meals makes no difference. In fact the more often you eat, the less satiety you may feel. It is not natural to feed constantly. Humans would feast and fast, and not eat as often as we do today. In fact studies have show an increase in coclon cancer for those who ate 4 times a day compared with those who ate only twice. Again this advice stemmed from the flawed food pyramid in number 2. This may work well if you are lean and metabolically healthy, but for those who are obese, diabetics or have metabolic syndrome, it is downright dangerous. Another reason why the entire bottom layer of the food pyramid is carbs and grains is because the wheat lobbyists got to the food pyramid before it was published and increased their portion, against the advice of the experts but by the government officials who were trying to feed a nation on cheap foodstamps. Polyunsaturated fats are supposed to reduce your risk of a cardiovascular event, however, there are both omega 3 and omega 6 fatty acids to consider. Omega 3 is anti inflammatory and omega 6 is inflammatory so we must get the ratio of omega 3:6 in our diet in favour of the anti-inflammatory omega 3 fatty acid. The major source of omega 6 in our diet is through processed seed and vegetable oils such as canola oil, sunflower oil, soy bean oil and corn oils. When research looked at specifically omega 6, its consumption actually increases your risk of heart disease. We already know the low fat diet currently recommended has resulted in rates of obesity, T2 diabetes and their associated complications like we have never seen before. Low carb diets are changing peoples lives, losing weight and getting many off their medications. Low carb diets have the potential to cure many of the health problems of the modern world. Low carb diets are consistently showing superior results and better outcomes. Whilst this is partly true, the real danger comes from the high fructose content of sugar which is metabolised by the liver into FAT resulting in raised VLDL, triglycerides, and causes leptin and insulin resistance, weight gain and loss of appetite control. The dangers of diets high in sugar go beyond empty calories, it causes disruption of the hormonal control of blood glucose, fat storage and appetite control leading to metabolic syndrome, weight gain and many serious diseases. It seems a simple concept that eating fat will make you fat, but this will only happen if you are eating a high carbohydrate and high fat diet. It is the carbohydrate making you store the fat. Carbohydrates drives insulin which drives fat storage. Eating a high fat diet (and low carbohydrate) will allow you to lose more weight than a low fat diet. BOTTOM LINE: Low carb diets are the healthiest, easiest and most effective way to lose weight and reverse metabolic disease. It is a scientific fact. Read this article to see how. Great article! It’s exactly these misconceptions that led me to launch http://www.fori.co.uk Hopefully we can help start to change the snack market, here in the UK at least. This is an old (2015? There’s no date and of course no author – who even spewed this bullcrap?) ridiculous (the article) and all the low carb nonsense and the statement that eggs are nutritious, which is even worse – I hope you (Carl Austin) have realized it by now, but if not, all that nonsense in this article has been disproved many times over by actual medical professionals and peer reviewed lab tests – nutritionfacts.org has all the info on there (website and same named YouTube channel). Good for you Dawn! Just goes to show we can make changes at any age. Very encouraging. Keep it up! I just read your article.. it was very well written, and very easy to understand. Last August 11, I cut sugar and grain from my diet. I am 56 years old, and last august I weighed 243 lbs. Almost 7 months carb free I am down to 165 lbs, and have gone from a size 20 pants to a size 9. And, the fat just keeps melting off. I am never hungry (unless I happen to have a tiny amount of sugar or grain) I am full of energy, and I am looking younger, a good 10 years younger than i did 6 months ago. I go to the doctors next week for the first time… I am bringing my old jeans with me to show the doctor just how big I was. I had high triglycerides and high blood pressure.. I am not sure about my blood glucose, but, I am sure it was high and should be improved. I dont ever feel as if I am on a diet, I am just not eating things that make me fat. Wow Linda, that us an amazing result, can you give me an idea of what you are eating on an average day now that you have settled into your regime? Also what level of exercise do you do, 35kg in 7 months is wonderful, well done. Another excellent article. Your website is absolutely tops! There’s so much information here, that no one should have any excuses for eating a SAD diet. Your article on Viscous Eating has changed my life. I then realized I cannot live WITH low amounts of sugar and wheat; I must totally eliminate them from my diet. I’m no longer hungry or craving, and it used to drive me crazy! Thank you, Gunnar! I love this article. I hate cooking but I will have to take that over from my husband so that I can get rid of rice, beans and pasta. Those are the easiest to drop when you make the plunge. Zoodles work great for pasta. I still use beans on a limited amount (bean flours mainly), I don’t miss rice. I do miss bread, but a good flat bread that is high fiber takes care of that craving. As long as I am under my carbs for the day.